Tired of trying to get control of your dog from clear across the dog park? You need this device developed by Auburn University College of Engineering researchers. 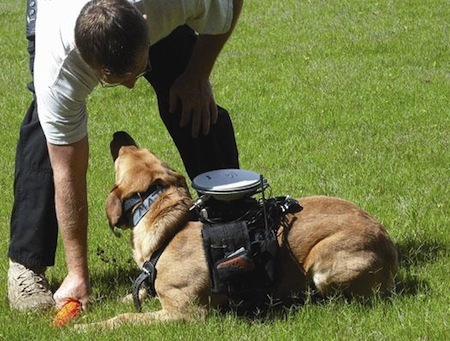 A specially-designed harness fitted with GPS sensors, a CPU, and a wireless modem connects with a base computer that human handlers can use to keep track of the canine and issue commands. The harness vibrates on the left and right sides and issues tones that the dog recognizes as commands, allowing the handler to guide the dog remotely. But the dog isn't the only element of the system that requires training. The software behind the system is trained in the canine's thought processes as well, taking the animal's natural inclinations into account. In this way, the system isn't just a means for handlers to issue hard commands; the handler can determine an objective or a destination for the dog, but the software takes into account the dog's innate capabilities and sensibilities to help it get to its destination accurately. In trials, the computer issued correct commands 99 percent of the time and a trained yellow lab followed those commands accurately 80 percent of the time (in the dog's defense, computers often perform more accurately than humans as well). Science fiction readers may be thinking of the neodogs from Robert Heinlein's 1959 novel Starship Troopers, or some of its newer gaming incarnations. He wore a belt beneath the robe, and attached to the belt was a box which glistened with keys and dials. It was an instrument of the Tleilaxu or the Ixians for certain. And it had to be the transmitter which released the tigers. Via Popular Science; thanks to Dave for pointing this story out, and providing a reference.